Donald Trump’s mission? 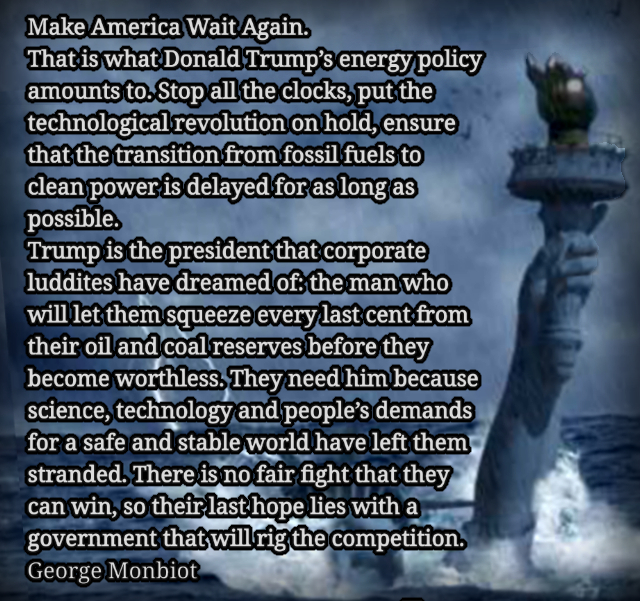 To keep the US in the fossil age – George Monbiot. Recent research suggests that, if drastic action of the kind envisaged by the Paris agreement on climate change is not taken, ice loss in Antarctica alone could raise sea levels by a metre this century, and by 15 metres in subsequent centuries. Combine this with the melting in Greenland and the thermal expansion of sea water, and you discover that many of the world’s great cities are at existential risk. The climatic disruption of crucial agricultural zones – in North and Central America, the Middle East, Africa and much of Asia – presents a security threat that could dwarf all others. The civil war in Syria, unless resolute policies are adopted, looks like a glimpse of a possible global future. These are not, if the risks materialise, shifts to which we can adapt. These crises will be bigger than our capacity to respond to them. They could lead to the rapid and radical simplification of society, which means, to put it brutally, the end of civilisations and many of the people they support. If this happens, it will amount to the greatest crime ever committed. And members of Trump’s proposed cabinet are among the leading perpetrators. Previous PostHow statistics lost their power, and why we should fear what comes next – William Davies. Next PostTrump’s first speech in office was an unapologetic appeal to nationalism – Gary Younge.